THE TALENTED TWELFTH The 12 graduates of the D.C. Apprenticeship Academy are poised for success. A diverse group of 12 men are seated in the first several rows of the construction lab at the Academy of Construction & Design at IDEA Public Charter School. Draped around their shoulders are gold stoles representing the hard work done over the years as registered apprentices in electrical, carpentry and roofing. The magnitude of their accomplishments is in the numbers: completing 144 hours of classroom instruction and over 2,000 hours of on-the-job training in apprenticeships each year – all while working full time. 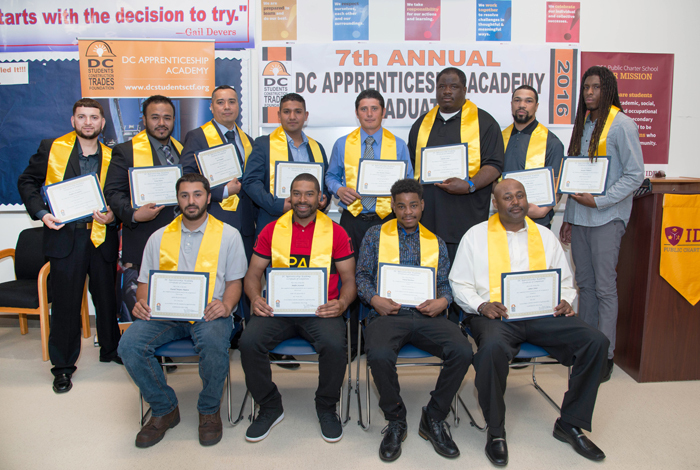 Through their efforts, they have become the latest class to graduate from the D.C. Apprenticeship Academy. 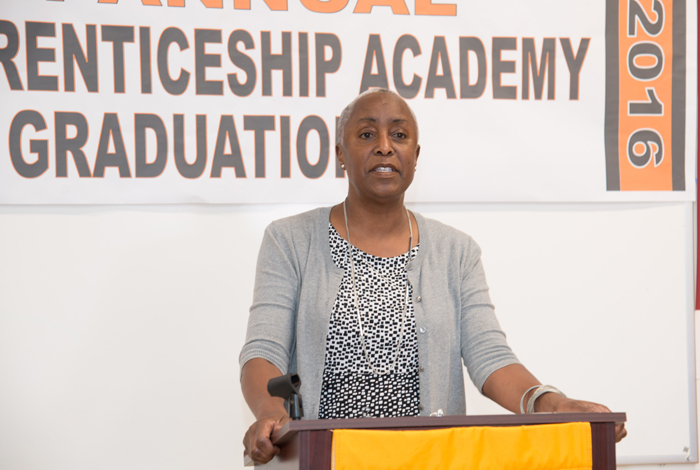 “Few of us complete the journey of accomplishment alone,” said Denise Crews, program manager for the Office of Apprenticeship, Information and Training at the Department of Employment Services (DOES), during her keynote address to the Class of 2016. And she was right. Graduate James Jones credited Marshall Janifer for helping to keep him and his carpentry apprentice classmates motivated. Janifer, the former lead carpentry instructor, passed away unexpectedly in 2014. Meanwhile, Beth Moore, program director for the D.C. Students Construction Trades Foundation, introduced at the start of the ceremony others who had supported this class in their journeys toward receiving their certificates of completion. Besides family and friends, Moore recognized apprenticeship instructors and staff, employers M.C. Dean, GCS Inc. and Gordon Contractors, and Foundation members. “We thank you for supporting the apprentices in their quest to build knowledge and skills in the construction trades,” said Moore at the June 8 ceremony. ‘PACE’ MAKERS Denise Crews with DOES says contractors need skilled workers to keep up with the city’s construction development. Sixty-three apprentices have successfully completed apprenticeship-related instruction since the first graduation in 2010. 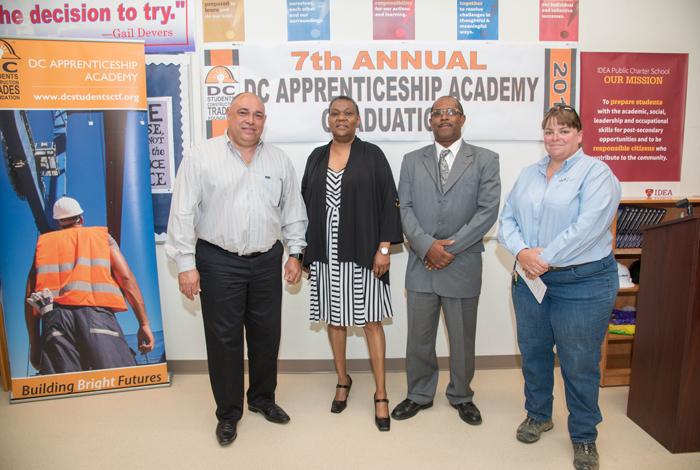 Seven years later, the D.C. Apprenticeship Academy continues to build on its success. This latest graduating class spans three trades: electrical, carpentry and roofing. Students completing instruction in the first two skills participated in a four-year program, with the latter being a three-year program. The electrical apprentices are now eligible for a license in D.C. with the credentials presented at graduation. Graduate Andre Antonio Licorish, 36, works with M.C. Dean, and decided to pursue the electrical track so he could one day open his own business. While admitting the four-year program was a struggle (taking a pay cut and waking up at 4 a.m. to arrive on the jobsite by 5:30 a.m.), he said the end accomplishment made it worthwhile. “To see how far you can push yourself to get to another level, it is a good feeling of success. And, you can use that as an example for whomever is coming behind you,” he told JOBS Coalition Pathways after the ceremony. To which the fellas responded with a round of claps and whoops. The same response erupted from the audience. “You are now highly skilled, qualified and in demand,” she announced. CLAP BACK The Class of 2016 applauds the guest speaker at the graduation ceremony. In a nod to their achievements, Crews outlined several “risks” the grads had taken to reach success. First, making the effort to go to DOES – whether walking, by bus or Metro – where apprenticeship training representatives provide detailed information about industry apprenticeships. Second, persevering despite not knowing if an apprenticeship would be a good fit. Third, showing up for the interview with the apprenticeship sponsor. And finally, arriving on that construction site early in the morning. Crews closed by urging graduates to make a difference in their lives and that of their children, to exceed expectations at the worksite, and to take a portion of their increased earnings to invest. “There are plenty of opportunities for everyone who dares to make a difference in their lives,” she said. WE SUPPORT YOU (l to r) Electrical instructor Alvin Pardo, DCAA Program Coordinator Lesley Harris, GCS Inc. carpentry instructor Jack Copeland and GCS Safety Director Erin Rush. 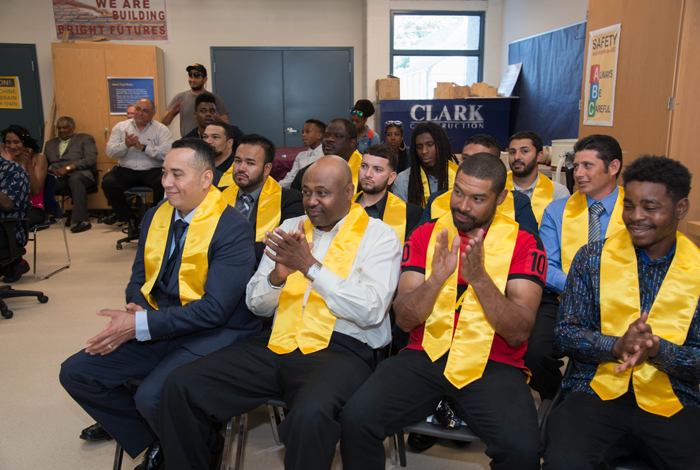 Next, Lesley Harris, program coordinator for the D.C. Apprenticeship Academy, joined Moore, Crews, electrical instructor Alvin Pardo and Foundation Board President John McMahon in presenting the certificates to the graduates. This year, nine completed apprenticeships in electrical, two from carpentry and one in roofing. The graduates walked to the front of the room, one by one, to receive the credentials that would make them eligible for journey licensing – a moment that could change their lives. For James Jones, 50, the acknowledgement meant more professional opportunities. While always striving to “lead by example,” he now is looking forward to taking what he’s learned and pursuing jobs beyond the foreman position he currently holds at GCS Inc. “I’ve got a leg up on someone who’s just getting into the field or who’s been in the field,” he said. As he spoke, Jones clutched the certificate in his hand – a reminder of what is yet to come.